After claiming no fewer than ten FIA European Pro Stock titles, Jimmy Ålund added his first FIA European Pro Modified championship to his impressive list of honours in 2018. 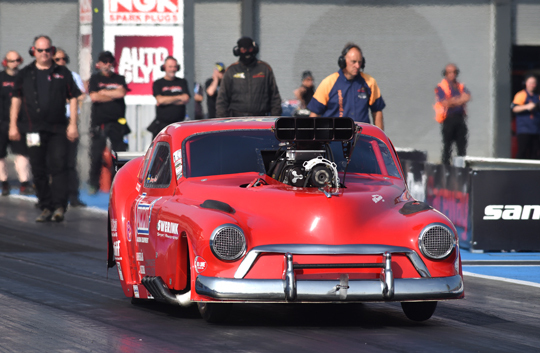 Being both quick and consistent, Ålund and the Magnus Petersson-owned and tuned Old ’51 Chevrolet dethroned 7-time FIA European Pro Mod champion Michael Gullqvist after an almost season long battle. And the hunger for more titles is still not over! Jimmy Ålund and Michael Gullqvist swapped the number one and two positions in the championship three times this season. 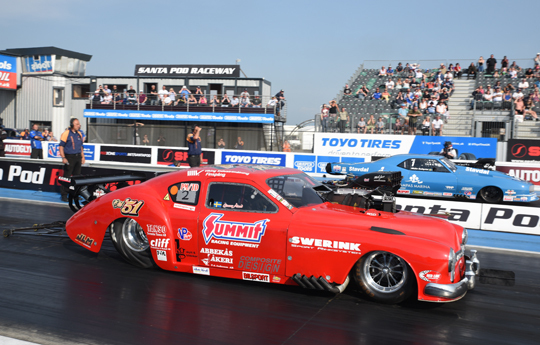 Ålund started his 2018 campaign with a runner-up finish at Santa Pod, to take the lead in the title race after another runner-up spot at Tierp. 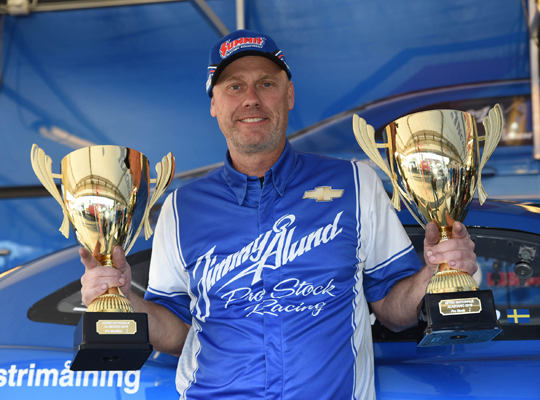 At Alastaro Ålund claimed his first win of the season and increased the points lead of the Old ’51 Chevy. A semi-final finish at Hockenheim was his worst result of the season and Ålund had to give the number one spot in the championship back to Gullqvist. 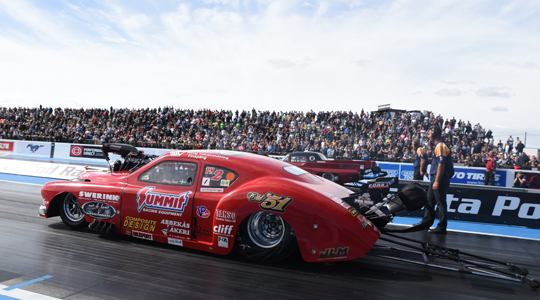 But at the Summit Racing Equipment Internationals at Tierp Ålund claimed another runner-up finish and was back in the lead, going on to clinch his first FIA European Pro Modified title in style with a commanding victory at the season ending European Finals at Santa Pod. 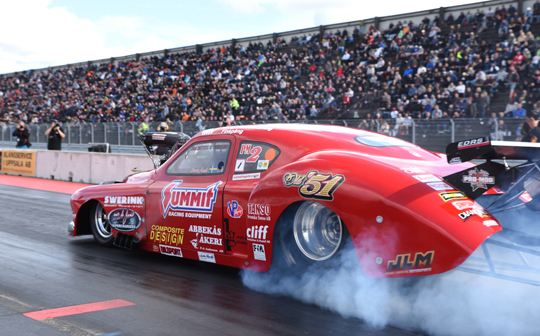 Even after winning ten FIA European titles, number eleven and the first in Pro Mod is special. We as a team worked very well together and had a lot of fun doing it. To have a 5.80-second car all season is something that we are very proud of. Our best race was Tierp in June, even though we didn’t win, we had great performance all weekend, qualified #1 and also won the final round against Michael Gullqvist in the Swedish Championship on Saturday night. Tierp in August was probably the most important race for winning the title because our closest competitor, Michael Gullqvist went out early and we went to the final were we lost to Andreas Arthursson, who blew the doors off everybody that weekend with mid-5.70s! Winning both Pro Mod and Pro Stock at Alastaro in Finland, which is something nobody has ever done before. That was a very cool moment in my career. When we struggled in Hockenheim, breaking the rear-end and having all kind of problems on top of that. Anybody can beat you in Pro Mod, so they are all tough opponents. But of course Michael Gullqvist and Andreas Arthursson are extra hard to beat, and Jan Ericsson and Roger Johansson and David Vegter, and the list goes on…..
All our sponsors that make this possible. Without them there is no way that we would be able to compete at this level. To have a consistent 5.70-second blower car (Magnus will fix that) and cut better lights (I’ll try to fix that). 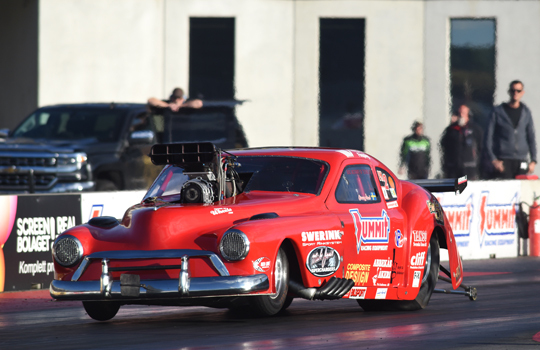 Win as many rounds as possible in both Pro Mod and Pro Stock and have fun doing it. And then hopefully I’ll have to answer these questions next year again.